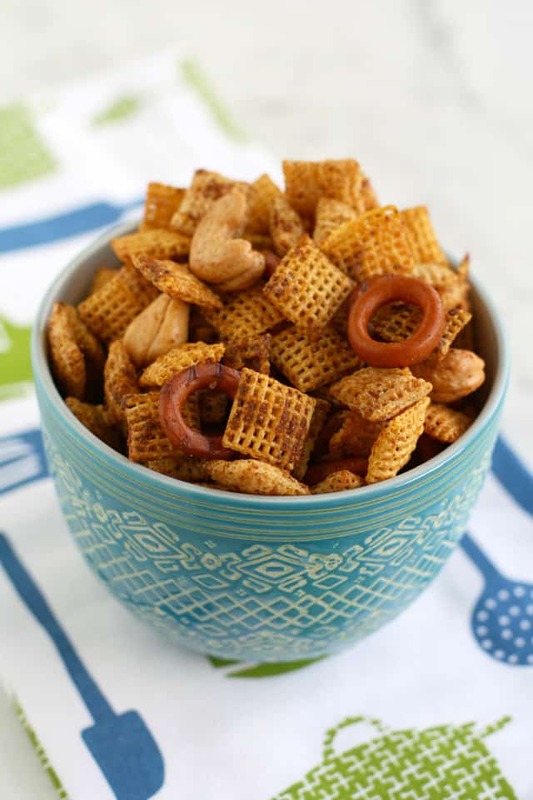 Home » Snacks » Sweet and Spicy Gluten Free Chex Mix. Sweet and Spicy Gluten Free Chex Mix. 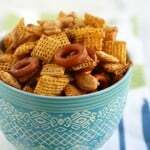 Delicious sweet and spicy gluten free Chex mix recipe – this flies out of the bowl at parties! Better make a double batch because this snack is a real crowd pleaser! I love a bowl of Chex mix during the holiday season. There’s something so nostalgic about it – I remember my mom making a big pan of it when I was younger. Chex mix isn’t always allergy friendly though – the store bought version contains allergens, and the original recipe calls for dairy, peanuts, or mixed nuts. That’s not going to work at our house! But, I knew I could make Chex mix fit into our allergy friendly lifestyle, and I was right. I mixed up the spices a bit, so this version is savory with a little sweetness from the brown sugar. This recipe was originally posted in 2014, before we had a tree nut allergy in our family. Now that we have a nut allergy to deal with, we just add more cereal or pretzels. Cheese crackers or seeds are another good nut free addition. If you want this gluten free Chex mix to be a little spicier, add more cayenne pepper. This homemade Chex mix is so addictive! If you can’t handle the temptation of a whole batch, it works well to just make a half batch. How do you make gluten free Chex mix? Mix all of your cereals, crackers, pretzels, and nuts or seeds in a large bowl. Melt the vegan buttery spread in the microwave and add the sugar and spices. Stir well. Pour over the cereal and other ingredients. Stir well. Spread out onto a rimmed baking sheet, and bake at 250 degrees for about 45 minutes, stirring occasionally. Is Chex cereal gluten free? Corn Chex and rice Chex are gluten free. Wheat Chex is NOT gluten free. No, Chex cereal made in the United States is not vegan, as the vitamin A and D that it is supplemented with is derived from animal products. There are some “off-brands” of Chex that may be vegan. Make a big bowl of this tasty gluten free Chex mix to enjoy with your friends this holiday season. 1 1/2 cups cashews You can leave these out and add pumpkin seeds, a different nut, or more cereal. 1 1/2 cups gluten free pretzels If pretzels don't work for your diet, leave these out and add more cereal. Pour the Chex, cashews, and pretzels in a very large bowl. Melt the vegan buttery spread in a microwave safe bowl. Add the spices to the melted spread, and stir. Pour the mixture over the Chex, nuts, and pretzels, and stir well to coat. Spread the Chex mix on a cookie sheet and bake at 250 degrees for about 45 minutes, stirring every 15 minutes. Let cool completely. Store in an airtight container. If you can't have nuts, feel free to leave them out and substitute more Chex, pumpkin seeds, or even dairy free cheese crackers. This Chex mix can be stored in an airtight container for up to a week. If you can eat dairy, feel free to use regular butter. NOTE: When I wrote this post in August 2014, Chex cereal was a safe vegan cereal according to my information. Readers have informed me that this may not still be the case. I am sorry for any confusion! Some off brands of chex-like cereal may be safe, you will have to do some checking. There you go! Chex mix for those of us who are on gluten free/dairy free diets! Yippee! For more gluten free snacks, try these crunchy oatmeal crackers. « Healthier Buckeye Candies (Gluten Free and Vegan). This snack mix is quite tasty with a hint of sweetness. I took it to a women’s gathering and it was a hit. Quite addictive. Makes quite a lot. Taking another batch to a birthday party tomorrow night where they’re serving Texas BBQ. Should go great with this fare. So happy you like it! Thank you for letting me know! This is every bit as good as the original and even better, you can’t taste the difference. As a recent convert to ethical veganism, I am finding more and more food items that appear to be vegan but are in fact, not (according to PETA, but sometimes they can be alarmist). I am wondering what brand of cereal you used for the “Chex”? From what I understand, Kellog’s uses animal derived vitamin D and some other brands use beef derived gelatin. And then there is sugar, which can be processed with bone char. My head is spinning trying to navigate the various traps that go against my goal! But I have also learned that many generic brands do not use animal derived products and was hoping you might be able to help me there. I live in the US, so most brands should not be too difficult to find. Thank you so much! I’ve really enjoyed your recipes! Hi there, I am not totally sure about this! Thanks for bringing it to my attention. At one point, Chex was listed as being vegan. Maybe they changed something? I will have to look into it further. Just a heads up, though, General Mills Chex is not vegan, it contains Vitamin D3. I absolutely love this chex mix and so does everyone I’ve shared it with! I’ve been missing homemade chex mix since I became vegan and although the flavor is different from the kind my grandfather makes every Christmas (obviously since his contains worcestershire sauce) the flavor of this one is SO addicting. It’s sweet and spicy and really unique. I’m already making my fourth batch this holiday season! Thank you so much for sharing! Thank you so much for letting me know! I love it, too! :) I made a big batch last week. Earth Balance makes vegan “Cheese Crackers” now too. Yay! I’m so glad you enjoyed it! Thank you for letting me know! This looks very interesting, and I plan to try it! One question: There are vegan versions of Worcestershire sauce on the market. Have you considered incorporating that into your recipe? Thanks! I don’t think vegan buttery spread is availablle for me. Could olive oil or coconut, etc be substituted? Trying to work this as eadible for diabetic and picky eaters for a mid-morning meeting treat. I would go with olive oil! That should work! This is absolutely DELICIOUS!! Even my non-GF husband approved! ;) Keep up the wonderful work. 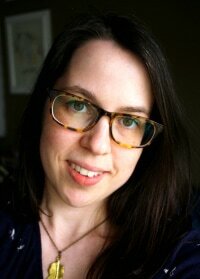 So enjoy your blog and recipes! Thank you so much for letting me know! Glad to hear it was a hit! :) Thanks for reading, I appreciate it. 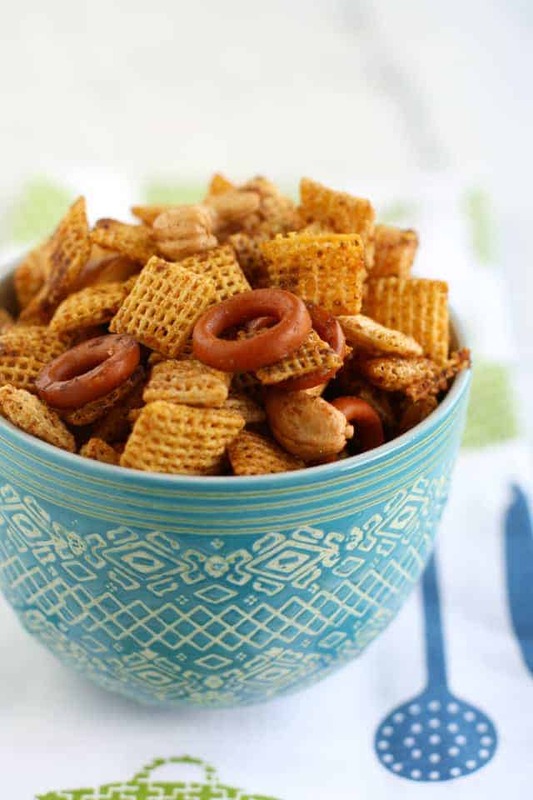 This chex mix recipe is AMAZING! My kids can’t get enough of it! 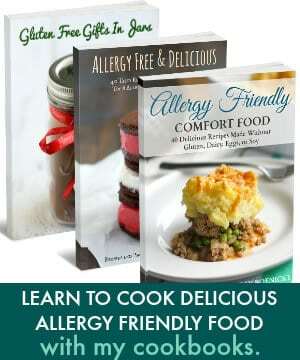 We have many food allergies and it’s nice to have a blog we can go to knowing we can eat any of the recipes. 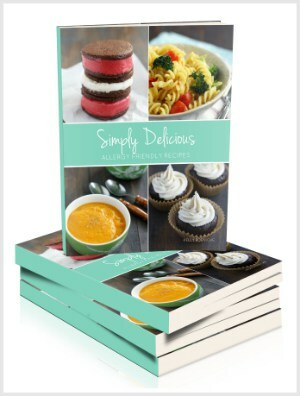 I have made dozens of your recipes and they have all tasted great! 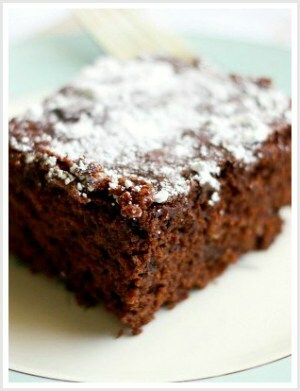 You are my go to recipe blog! Thank you for doing what you do! Yay! Another homemade snack recipe to add to my list! This looks great, and much healthier than the store-bought stuff! I am totally craving some chex mix right now. It’s one of my favorite snacks, and I love that you made this vegan! Gorgeous pictures, too! I actually was searching for chex mix recipes because I’m abit over giving granola as gifts to others- thanks for the recipe- and vegan to boot! I don’t know if the store bought kind is vegan, but the original home made version contains butter and Worcestire sauce, so that’s definitely not vegan! I ate a ton of chex mix after a night out recently and it was delicious. But this looks way better because I know what’s in it! This looks so good! I love chex mix, I usually get the “cheddar” flavor, even though I know it has a bunch of weird ingredients and too much sodium. What a great idea to make your own! I don’t think we have chex mix here in the UK, but I think I would love it! Fabulous! I didn’t even realize gluten-free pretzels existed and I’m trilled to track them down! Chex mix was always one of my favorite snacks growing up, and it never dawned on me I can still enjoy a GF version. Have a wonderful weekend, my dear! Yes,there are several brands of GF pretzels! Glutino makes them but they are pricey. These round pretzels are by Ener-G.